We begin 2019 with everyone’s favorite season opener, the St. Patrick’s Classic at Virginia Motorsports Park with our tried-and-true FAT $5K / $10K / FAT $5K format for two classes: both Top ET and Footbrake. Our summer race at VMP, the Colonial Classic, will return to its roots with the same FAT $5K / $10K / FAT $5K format for both Top ET and Footbrake as well. “What’s a FAT $5K?” — Our $5K races are bursting at the seams with money, paying $100/Rnd starting 3rd Rnd Win, the same as most $10K’s! That stacks up in a hurry to help pay for your weekend! NEW event for 2019! 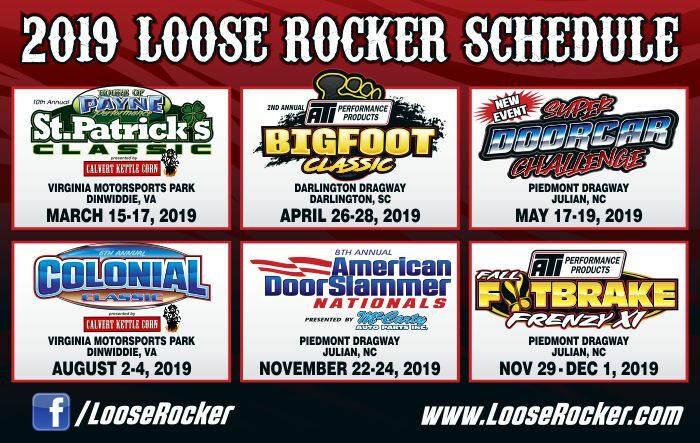 — Loose Rocker has added a new event for 2019, based on our popular Doorslammer specialty event, but in the spring! Join us May 17-19, 2019 at Piedmont Dragway for the Inaugural Super Doorcar Challenge! Bookending the season with Specialty events! — We’re very excited for 2019, with the Inaugural Super Doorcar Challenge joining the ATI BIGFOOT Classic in the Spring, and our ever-popular November races at Piedmont Dragway to finish off the season. Now you have both a Footbrake and a Doorcar race at the beginning of the year, and a Doorcar race and a Footbrake race at the end of the year!